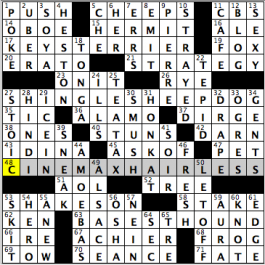 The Chronicle of Higher Education has a special issue this week, so no crossword. It’s late, I have an early start tomorrow, let’s do this quickly. Likes: ABDUL-JABBAR, CHEERLEADER, quaint old PERIWIGS (though I prefer the perukes spelling), DRACONIAN, RADIOLOGIST, ONE-TWO PUNCH, GARTER SNAKE, EPHEMERAL, BAHRAIN, and the funny LOUIS C.K..
30d. [Master], SAHIB. This clue might be decades old and a little gross. I mean, Oxford Dictionaries defines sahib as “a polite title or form of address for a man,” and this guide to Indian English says it means “boss” or “person of higher status.” This [Master] clue smacks of the original colonial usage in which brown people were expected to address certain white people as sahib. Can we move into the 21st century, please? I’d love to hear what any desi readers think. Least enjoyed fill: EDOM, IRANI, TBAR, ADANA (really?? A Churchill conference site and yet it doesn’t appear in crosswords nearly as often as A Bell From ADANO?? ), ANE. 60d. [Almond ___ (candy)], ROCA. Almond Roca is a brand name. It’s crunchy toffee, with chocolate. It’s delicious. 64a. [Author Chinua Achebe, by birth], IBO. Second time the Ibo people have come up in my day. First time was telling a writer I follow on social media, Ijeoma Oluo, that Facebook was suggesting another Ijeoma (a FB friend of a Nigerian crossword guy) as a potential FB contact. Ijeoma #1 told me that it’s a very common Ibo name. (Ibo and Yoruba are two major ethnic groups in Nigeria. Over 20 proper nouns? An awful lot for a 72-worder. Doesn’t bother me in the slightest (cultural and world literacy! ), but many solvers grumble about a plethora of names. Happy Friday, everyone! Have to keep this short, as I’m in the middle of reporting a sporting event from a different city for at least seven consecutive days (came back from Boston, now I’m heading to Stamford, CT…for a hockey game). Today’s grid, brought to us by Mr. Todd McClary, has a great theme: the entries are puns that play off the actual names of dog breeds, with the first word of each theme consisting of an anagram of the first word in the actual breed’s title. Or something like that. KEYS TERRIER (17A: [Small breed found on laptops?]) – Skye terrier. SHINGLE SHEEPDOG (27A: [Herding breed that barks “Roof! Roof!”?]) – English Sheepdog. 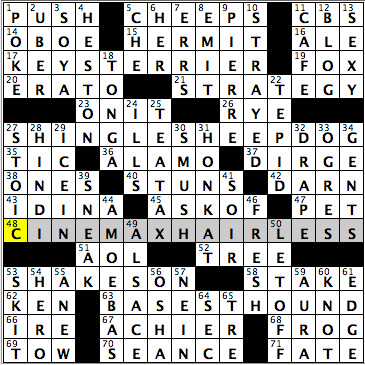 CINEMAX HAIRLESS (48A: [Smooth-skinned breed leashed with premium cable?]) – Mexican Hairless. BASEST HOUND (63A: [Hunting breed frequently awarded “Worst in Show”?]) – Basset Hound. Very fun grid, and liked seeing IDINA, as it reminded me of John Travolta’s massive fail at the 2014 Oscars in trying to pronounce her name (43A: [Menzel of Disney’s “Frozen”]). For those of you representing South Dakota, you’re in luck with PIERRE today (9D: [Capital on the Missouri river]). Don’t worry, South Dakotans, I know how to pronounce that city’s name correctly! There’s a prevalence of two-word actions in this grid, with HONK AT (31D: [Warn, while behind the wheel]), ICE IN (29D: [Leave stranded during winter, perhaps]) and SHAKES ON (53A: [Agrees to, as a deal]). Again, after I say that I have to make this blog short, I don’t. Let’s see if I can make the next graph short as well. I doubt it! “Sports will make you smarter” moment of the day: HESTON (4D: [Prominent NRA spokesman of the early 200s]) –No, not going to talk about Moses from the The Ten Commandments in this space. On June 9th of last year, San Francisco Giants pitcher Chris HESTON threw a no-hitter against at Citi Field against the New York Mets. In the no-no, he struck out 11, walked none and hit three batters. Heston faced three batters in the ninth inning and struck them all out, becoming the first pitcher to strike out the side in a no-hitter with a maximum of three batters faced since Sandy Koufax’s perfect game in 1965 against the Chicago Cubs. Thank you for the time, and have a great weekend! I’ve left this rather late… Let’s see. Fun theme, if a touch loose. 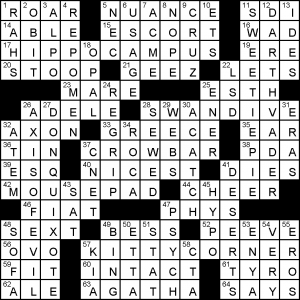 Second part of theme answers are vague locations; first parts are either a mammal or a bird. The theme answers are reimagined such that they are all [animal] is in [location]. The quintet are HIPPOCAMPUS (the word either refers to a mythical sea monster, or a part of the brain); SWANDIVE; CROWBAR; MOUSEPAD; and KITTYCORNER. [’80s defense prog. ], SDI. Will forever be associated with Civilisation for me. [Moon observation], MARE. Lunar “sea”. [iPhone, e.g. ], PDA. Um, who is still referring to things as PDAs? [Panda maker], FIAT. I drive a Fiat Panda!!! I didn’t know they were a thing in the States! [Honey alternative], SWEETIEPIE and [AFI’s third-greatest movie villain], DARTHVADER – fun stack, though incongruous. [War on Terror epithet], AXISOFEVIL and [“Ingenious gentleman” of classic fiction], DONQUIXOTE. Another interesting juxtaposition. Is it strange that I dropped DOCTORAZIZ (also Scrabbly!) off the D? This entry was posted in Daily Puzzles and tagged Evans Clinchy, Marcia J. Brott, Todd McClary, Tom Pepper. Bookmark the permalink. i will say this about sahib: it’s on my list of words i know only because i’ve begrudgingly used it before in my own crosswords (i.e. it’s a word i hate for its connotations, but it gives the best surrounding fill). that said, it did seem the drecky stuff clumped together. the middle (sahib/natl/fha) and lower left (edom/adana, a crossing that will probably natick quite a few) stuck out enough that it bothered during the solve. Adana ojai’d me too, though I should have known it. I occasionally have lunch at a couple excellent restaurants in Natick. Huda, your comment about Irani – Iranian is interesting. I don’t mind Iranian, so long as one doesn’t pronounce it Eye rain ean. I have a friend, Bente, from Norway and a similar issue arises in my mind — Norse vs. Norwegian. I think of Norse as the language and Norwegians as people, but I don’t know if that’s “right.” I haven’t asked her, but perhaps now I will, the next time I see her. I wasn’t crazy about the transit systems either. Maybe one was enough, but I like the puzzle, so I didn’t downgrade it. NYT: Parts of this fell like a Monday, but other places had too many names, given my lack of cultural and world literacy. A definite and irretrievable Natick at ADANA/EDOM– Lots of alternatives felt reasonable. Re SAHIB: I imagine the word origin is Arabic, and in Arabic the meaning is lovely– a good, trustworthy companion, a pal, not quite a friend (which is SADIQ). It’s really too bad it got these other connotations when it traveled to English. 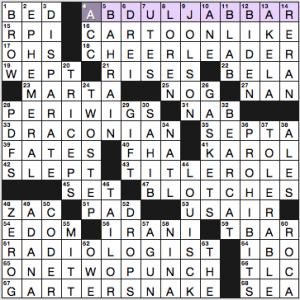 The puzzle felt like an odd combination of train systems and Arabic-related entries– Sahib, Akela (in Arabic means wise) Kareem (generous) Abdul Jabbar (Follower of the Powerful–i.g. God), Bahrain (Two seas) and its clue. I thought IRANI refers to people and Iranian would refer to cities… Is that incorrect? Huda, as far as I know, IRANI is a word used exclusively in crosswords. If I wanted to refer to someone from that country I would say Iranian. I knew EDOM but had no idea about ADANA (I put in YALTA at first but that obviously didn’t work). Otherwise a pretty straightforward Friday puzzle. I thought L and D were both plausible for aDana/eDom, but guessed correctly. As Huda suggested, I thought parts (most of the North) were very easy and others were quite difficult. I did know all the sports-related clues and that helped. Regarding the NBA MVP, what is likely to happen this year that has never happened before? Okay, I’ll bite — what’s going to happen? A team (GS Warriors) will lose less than 10 games? It is presumed that Steph Curry will be the first unanimous MVP. Several players have gotten every vote but one, but no one has ever been unanimous. It is hard to imagine anyone else getting a vote this year. On the other hand, no baseball player has ever been a unanimous selection to the baseball hall of fame. How anyone could have conceivably not voted for Babe Ruth, Willie Mays and several others means that the voter had some agenda other than recognizing hall of fame worthiness. Cute theme for the LA times, but unless they are visiting their cousins, Heckle and Jeckle would not hang out at a crowbar; they are magpies. NYT: periwig vs. peruke – Don’t favor peruke. Although periwig apparently came into English as an etymological mistake, with English speakers associating the ending of the Middle French word “perruque” with the English word “wig,” there are many examples in literature of each word. In fact, my first Google search page indicated that, of the two, “peruke” is the word that is archaic, although most online dictionaries seem to accept both words. Anyway, variants seem to be acceptable in weekend puzzles, although perhaps these would be considered two separate words, rather than variants of each other.